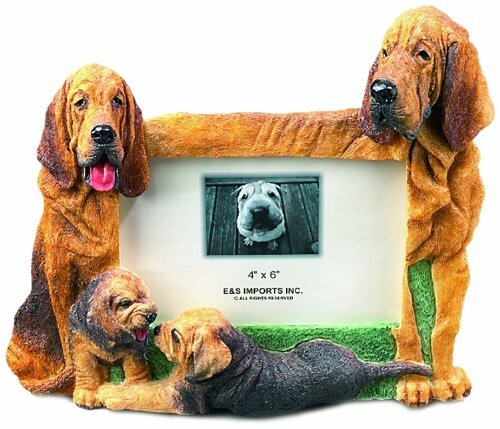 Bloodhound Gift Picture Frame Holds Your Favorite 4x6 Inch Photo, A Hand Painted Realistic Looking Bloodhound Family Surrounding Your Photo. This Beautifully Crafted Frame is A Unique Accent to Any Home or Office. The Bloodhound Picture Frame Is The Perfect Gift For Bloodhound Owners And Lovers! Announcing this year’s best gift for Bloodhound lovers everywhere! This unique picture frame stands 6 inches tall, holding a 4x6 inch photo of your favorite furry friend. Each frame is hand painted to give the frame its own personality and distinctive look. The personality of each Bloodhound is truly captured in the unique design. This hand painted frame with intricate detail is the perfect place to put your favorite picture. This frame features a Bloodhound family surrounding the outside of the frame, but is also enhanced with an easel back stand for added security. Look no further for the perfect gift for that pet lover you had in mind because this frame is sure to wow anyone who sees it! It’s a simple yet affectionate gift to brighten any room in your home or office.